Free Printable Person of Interest Crossword. Free Printable Crossword for all the fans of the TV series “Person of Interest”. Print it using your inkjet or laser printer and have a great time solving this crossword with your friends, co-workers, and family. The crossword includes 14 words and names related to the series. Includes the answers on page 2 with words and names like Private Person, Social Security Number, Root, CIA Operative, Control, Samaritan, Decima Technologies, Lionel Fusco, Joss Carter and more. 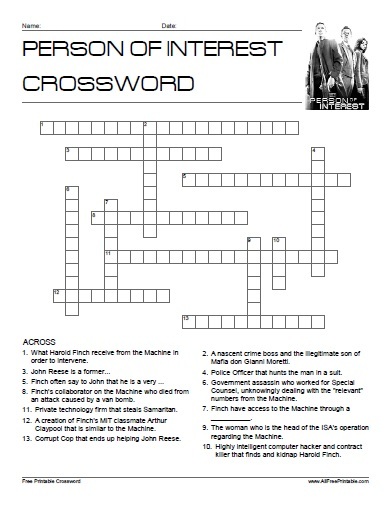 Click the link below to download or print the Person of Interest Crossword now in PDF format.